Alexander Loughran was born in Castlecaulfield about 1891. It seems Alexander worked in Hamsterley Colliery in County Durham. Alexander enlisted in Newcastle on Tyne. Corporal Alexander Loughran was serving with the 14th Battalion of the Durham Light Infantry when he died on Died on 10th May 1916, age 25. 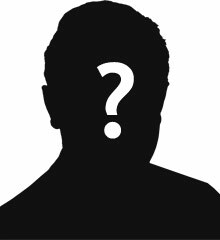 Alexander Loughran was the husband of Mrs. C.E. Loughran, "Inglenook" Oakwood Road, Blackhill, County Durham. 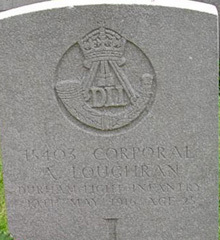 Corporal Alexander Loughran is commemorated on several memorial War Memorials in County Durham. Lijssenthoek Military Cemetery is located 12 Kms west of Ieper town centre, on the Boescheepseweg, a road leading from the N308 connecting Ieper to Poperinge. From Ieper town centre the Poperingseweg (N308) is reached via Elverdingsestraat, then over two small roundabouts in the J. Capronstraat. The Poperingseweg is a continuation of the J. Capronstraat and begins after a prominent railway level crossing. On reaching Poperinge, the N308 joins the left hand turning onto the R33, Poperinge ring road. The R33 ring continues to the left hand junction with the N38 Frans-Vlaanderenweg. 800 metres along the N38 lies the left hand turning onto Lenestraat. The next immediate right hand turning leads onto Boescheepseweg. The cemetery itself is located 2 Kms along Boescheepseweg on the right hand side of the road.